We believe the church isn't a building you go to, it’s a family you belong to! 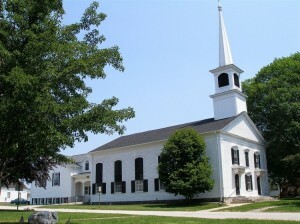 The mission of the Columbia Congregational United Church of Christ is to worship God and to preach and teach the Gospel of Christ; to promote Christian fellowship among our members and friends, and to live in Christian fellowship with the Church Universal and the whole creation; that we might live faithfully, serving God and humanity, and striving for righteousness, justice, and peace. As I hope you are aware, the Church membership voted to go forward with the repair of the front steps. This is a project that has needed doing for some time. Three people were asked to bid on the project, two submitted bids and Mr. Jim Blair was selected to do the work. The bid selected was approximately $17,000.00. Because of the cost, we are soliciting donations from the membership. Although this is not the type of project that lends itself to donations “In Memory off” or placards with family names, it is a project that involves safety for our community and integrity of the church building. Therefore, we ask for your assistance. Donations may be made on line, turned in at the Church Office, given to the Finance Committee or put in the Church Offering as long as they are identified for “front steps”. Thanks for your assistance.